A Christmas tree that's good enough to eat is the must-have decoration at Waitrose & Partners this Christmas. Herb-loving shoppers are in for a treat as the retailer will be stocking rosemary Christmas trees, after proving a hit last Christmas. The herb is a favoured garnish of choice for the grocer’s shoppers at Christmas, making it into the top 3 best selling fresh herbs with sales up 200% over the festive season compared to the rest of the year. 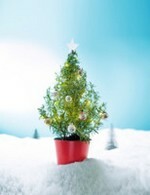 The alternative Christmas trees proved a popular purchase last year with sales rising as environmentally conscious consumers looked for a multi-purpose tree that could be re-used or to give to friends and family as a festive host gift. The trend for rosemary Christmas trees started in America where just as many are now bought compared with standard Christmas trees. Their needle-like leaves make them the perfect alternative for the festive season and can be decorated to look just like their larger traditional counterparts. They can be used as a decoration in the lounge, placed on the kitchen window sill or even as a Christmas table centrepiece where guests can pick the tree's leaves to garnish their own festive feast - making them the perfect gift for foodies.